Rejuvenate specialises in gentle tattoo removal and we are able to work on all skin types (including dark Asian, Black skin) Scarring is a very real risk however if this procedure is done correctly that risk is minimised. How tattoo removal technology works by allowing the light produced by the laser to pass through the skin and break up the tattoo ink into tiny particles, your body then disposes of these fragments. The number of sessions required will depend on many factors including the colours used in the tattoo, as well as its size and density, can all affect the suitability of a laser removal treatment, how long it will take and how effective it will be. It might be that you’re only looking to fade your tattoo so you can have a different design? It is essential to discuss these elements with your practitioner, who can ensure your tattoo is removed in the safest and most effective way for you. 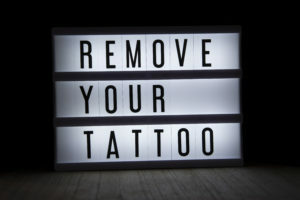 Laser Body Tattoo Removal in Sawbridgeworth, Hertfordshire and are with 30 mins drive of Bishops Stortford, Epping, Sheering, Harlow, Hatfield Heath, Hatfield Broad Oak, Birchanger, Takeley, Stansted Mountfitchet, Manuden, Fyfield, Elsenham, Hoddesdon, Furneux Pelham, High Easter, Henham, Chipping Ongar, Hertford, Widdington, Clavering,Theydon Bois and other surround towns in Essex, Herts and London.